PLEASE NOTE: The 2010 Update has been released! Please see my Taiwan IME 2010 Update FAQ for more information. The 2010 update is for Windows 7, Vista and XP SP3, and does not require Office 2010! This page is archived for anyone with Windows XP SP2 and earlier, and for anyone wanting to go back to the 2003 versions of the Taiwan IMEs for any reason. Everyone else should get the Taiwan IME Updates released with (but not requiring) Office 2010. Is there a way to update/upgrade/repair my Microsoft Taiwan (Traditional) input methods if I have Windows XP and Office 2003 or earlier, or no copy of Office at all? traditional character input methods, and may repair broken Chinese features too. 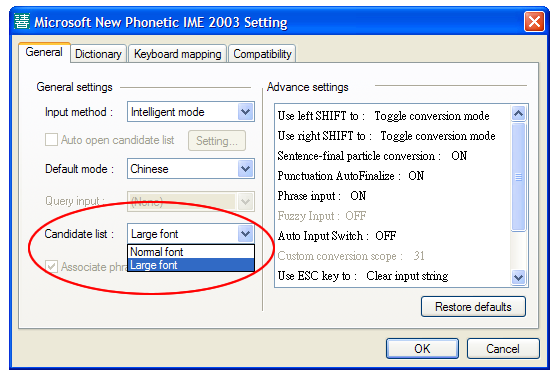 The Free Microsoft New Phonetic 2003 update adds several new features to this Taiwan (traditional) Pinyin/Zhuyin input method, including the option to increase the size of the characters in the candidate list. This update is for Windows XP with Office 2003/2002/XP or with no MS Office at all. The following instructions assume that you have already enabled East Asian languages in Windows XP and set up Pinyin input in Windows XP. Then look at the blue title bar at the top of the panel that pops up to see what version you have. Is it "2002a", "2003", or something else? *If the Tool Menu is not displaying, you can fix that later in Language Band settings, but right now just right-click on the "CH" and select "Restore the Language bar" so you can see that menu. Is this for 32-bit systems only? I have not yet tested this free update on a 64-bit system and would be interested in hearing from you if you cannot install it for any reason. In recent years 64-bit updates have been for sale only, included on the Proofing Tools disk of the 32/64-bit Office Language Packs, and I'm wondering if this was the case with Office 2003 MUI Packs. Although that page is titled "Microsoft Office 2003 IME", don't worry if you have an earlier version of Office or don't have Office at all. You'll still be able to install this. TINTSETP.MSI is the New Phonetic IME (Pinyin and Zhuyin) update. SINTSETP.MSI updates the IME Pad, and CINTSETP.MSI updates the Cangjie input method. If you don't see that Help menu in the Language Band you can adjust those settings later, but right now you can just right-click on the CH button and select "Restore the Language bar" to pop the whole thing up to the top of your screen. Windows XP Pinyin input setup (jump to "Installing Traditional"). Windows XP Zhuyin input setup (see section on keyboard layout).